Since Halloween is quickly coming, and Candy-corn is secretly being consumed in large quantities across the country, we decided to create a massive fall celebration cake! We have been wanting to share our Chocolate Carrot Cake recipe with the world for a while now, and we thought that this would be a great way to showcase it. Plus we are on a carrot cake kick; check out our Buttermilk Carrot Cake from last week. 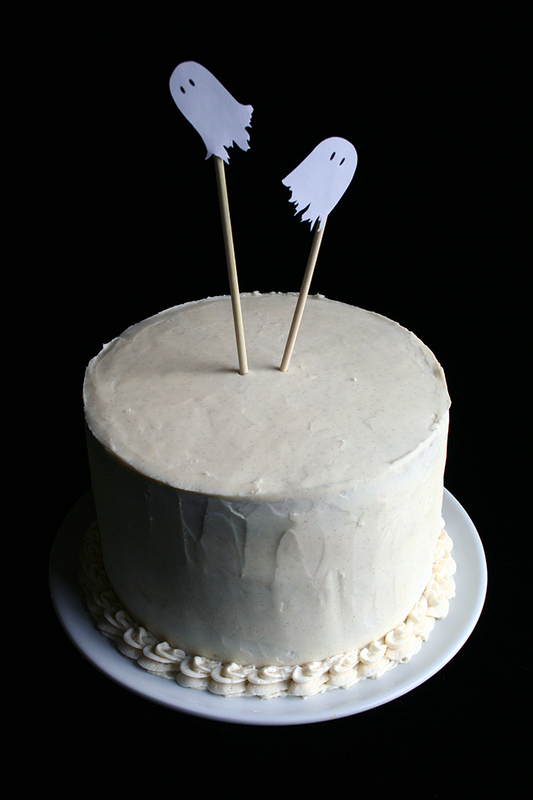 For this cake, Candy-corn (specifically Indian Candy-corn) was our inspiration. Indian corn, also known as flint corn or calico corn, is a symbol of the harvest season because of its multicolored kernels. It is also one of the oldest varieties of corn. Now, Indian Candy-corn is different from the basic Candy-corn. Instead of the layers being yellow, orange, and white, Indian Candy-corn colors are brown, orange, and white… the brown being chocolate…! Oh, and did you know that this past Easter season, a Carrot Cake Candy-corn was released? Who knew! Okay, now to this cake! 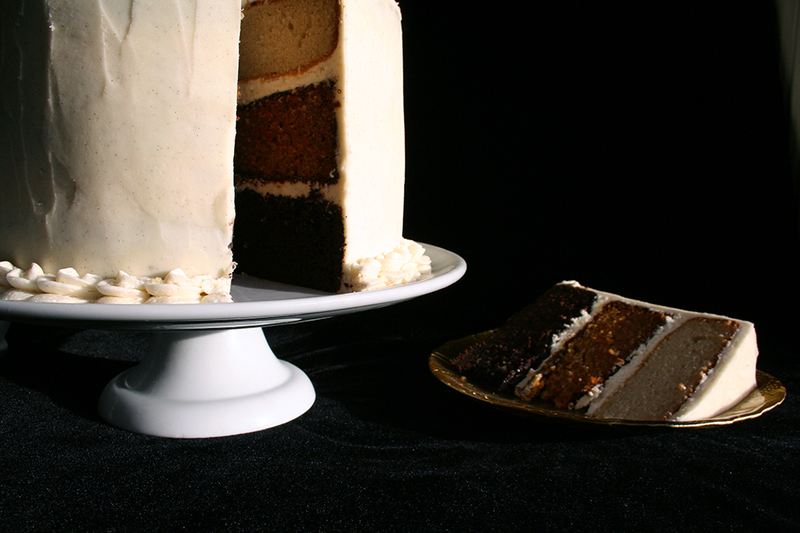 The top layer is a vanilla bean cake (recipe can be found in our Fig Filled Vanilla and Anise Cupcakes), the middle is our Buttermilk Carrot Cake, and the bottom is our decadent Chocolate Carrot Cake recipe, and it is all topped off with a Whipped Vanilla Bean Frosting! 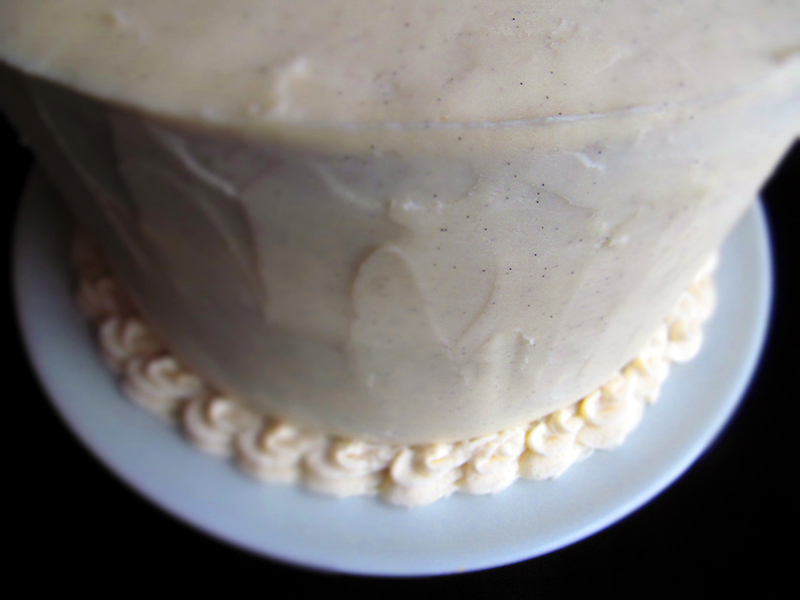 For tips on not over-mixing cake batter, check out our Buttermilk Carrot Cake post! The Chocolate Carrot cake recipe, which is featured in this post, was originally created back in May for a toddler’s birthday cupcakes. This little girl just happens to be a huge fan of carrots, and she is convinced that chocolate syrup should be used like ketchup, not to mention that brown cows make chocolate milk! They were a hit with both the kids and the adults at the party. The carrots make the cake super moist, while the spices add a complexity to the chocolatey decadence. Moist and chocolatey, would never guess there are 2 cups of carrots hidden in here! Preheat oven to 350°F and prepare pans, set aside. Beat sugar and eggs together until smooth. In a separate bowl whisk together flour, cocoa, baking powder, baking soda, ginger, cinnamon, and salt. Alternate adding dry ingredients and milk until almost combined, stop mixer. Using a spoon or spatula mix in carrots until just combined, careful to not over mix. Bake for 30-45 minutes. Or until a tester comes out clean. If making cupcakes, fill cupcake liners ½ way and bake for 15-20 minutes. Or until tester comes out clean. *If chocolate is still very warm be careful to add slowly and keep the mixer running so it doesn't cook the eggs.